Melbourne: World champion Lewis Hamilton scorched to his 50th career pole position at the Australian Grand Prix on Saturday as Formula One’s new-look qualifying format fizzled out in an embarrassing anti-climax. 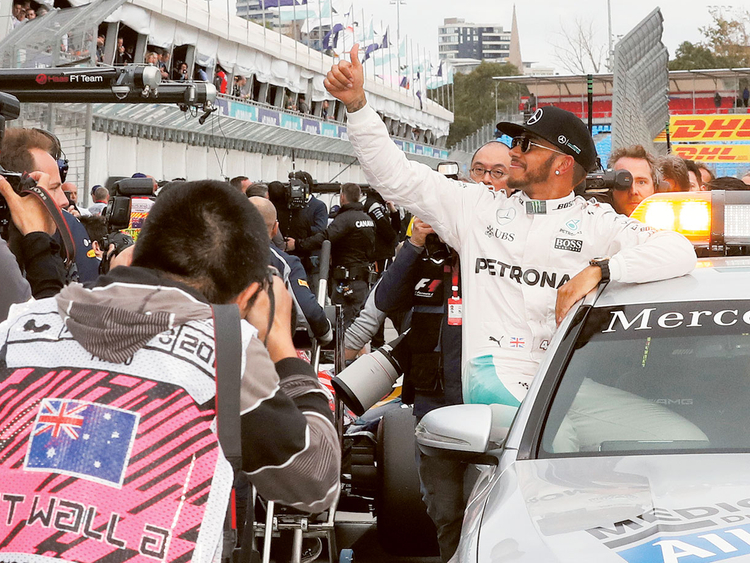 Hamilton picked up where he left off in the last championship season of 10 wins and 11 poles as he destroyed his rivals, including Mercedes teammate Nico Rosberg, to front the grid for Sunday’s season-opening race in Melbourne. The three-time champion led almost throughout as he progressively improved his lap time over the three qualifying stages to clock a best time of one minute 23.837 seconds. “They were some good laps,” grinned Hamilton afterwards, lavishing praise on his team for their work on his Mercedes car. He will start inside Rosberg on the grid with the Ferrari pair Sebastian Vettel and Kimi Raikkonen unable to match his blistering pace and both starting off the second row. But the new elimination qualifying format petered out with Vettel, Raikkonen and Rosberg not bothering to improve their times in the final minutes, bringing matters to a premature halt — to the consternation of the teams and fans. “I miss the old days of qualifying when you would go out and run and run and run,” Hamilton said. “This whole out one lap is neat but I think people were saying it was not exciting for the fans. Vettel was more scathing in his criticism of the new qualifying format. “For the people in the grandstand I don’t feel it’s the right way to go,” the German said. Hamilton has been without peer and has registered the fastest times in all three practice sessions and qualifying to be the undeniable favourite for his 44th GP win on Sunday. The German Mercedes team has ruled Formula One for two years, winning 32 of the 38 races. Manor Racing’s Pascal Wehrlein was the first man eliminated under the new knockout qualifying format, which whittles down the field at 90-second intervals. He was followed by his Indonesian teammate Rio Haryanto, who went into qualifying with a three-place grid penalty for his pit lane crash in final practice. Hamilton went quicker, clocking 1:25.351 — nearly a second faster than last year’s pole time — to clinch his place in the second phase of qualifying as the field began to thin. Red Bull’s Russian driver Daniil Kvyat was the first major casualty of the qualifying shoot-out when he missed out in the first cut. Denmark’s Kevin Magnussen in a Renault was the first out in the second part, followed by his rookie English teammate Jolyon Palmer. Jenson Button didn’t even try to improve on his time and was already out of his McLaren as the clock ticked down, as he went out along with his teammate Fernando Alonso. The last eight for Q3 were Hamilton, Rosberg, Vettel, Carlos Sainz, Ricciardo, Raikkonen, Max Verstappen and Felipe Massa. Hamilton was 0.6sec quicker than Vettel in Q2. Vettel briefly led the timesheets but Hamilton quickly reasserted command, reeling off a lap half-a-second quicker than the German with 1:24.133 and then scorching to his 1:23.837. Australian Daniel Ricciardo was the first driver knocked out in Q3, followed by Toro Rosso’s Carlos Sainz, Felipe Massa in his Williams and Dutch youngster Max Verstappen in the other Toro Rosso, leaving Mercedes and Ferrari to fight it out. But Ferrari duo Vettel and Raikkonen stayed in the garage along with Rosberg, preferring to save their tyres for Sunday’s race — and making for the awkward early finish.